VALET PARKING IN THE DAMIEN PARKING LOT IS SOLD OUT. Farrington High School Parking - Click to see a larger image. Limited free walk-in parking is available at the Carpenters Union next door to Damien. 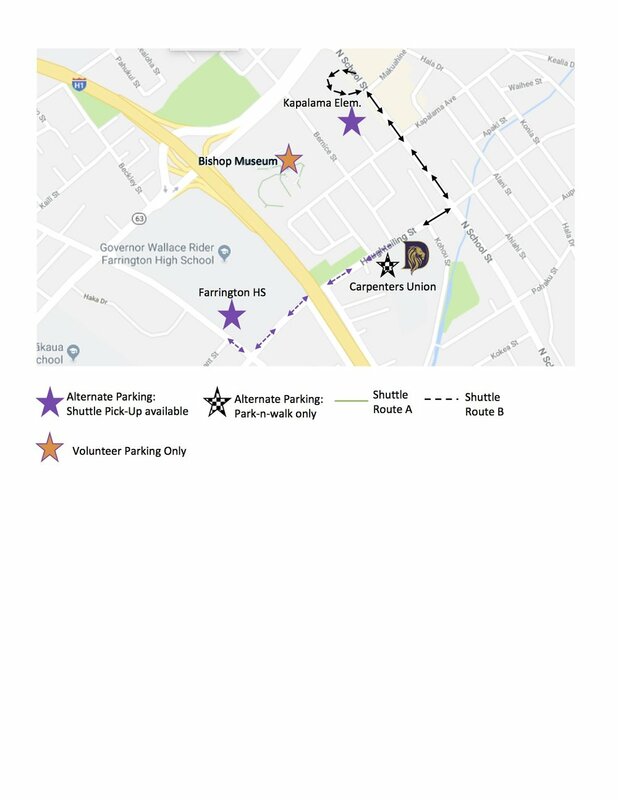 Parking at Kapalama Elementary and Shuttle Pick Up Information. Click to see a larger image. Additional free parking will be available at Kapalama Elementary and Farrington High School. You can either park and walk from there, or you can wait for free shuttle service that will run on a regular basis between 11:00 AM - 1:00 PM and then again from 3:00 PM - 4:30 PM. Volunteers, please park at Bishop Museum parking lot.